Tonight I made my first "true" visit to the Kogi bbq truck. My friend Matt from Canada was comin in and I noticed on Tweeter that the Kogi truck was gonna be in Torrance - what better LA cultural experience to give a visiting 'foreigner'. They tweeted that they were gonna be there longer than expected because "they won't let us leave", so we decided to make a run for it in case we could catch them before they took off for their next stop in Venice. We made it just in time and found them in a remote corner of Torrance next to the Toyota plant. A crowd was around but we made it in time to make the last order for the stop. It was every bit as good as I wrote about earlier when the truck 'catered' a design mixer I went to, though the wait was significantly longer. Pretty amazing to draw a crowd like that in the middle of nowhere. 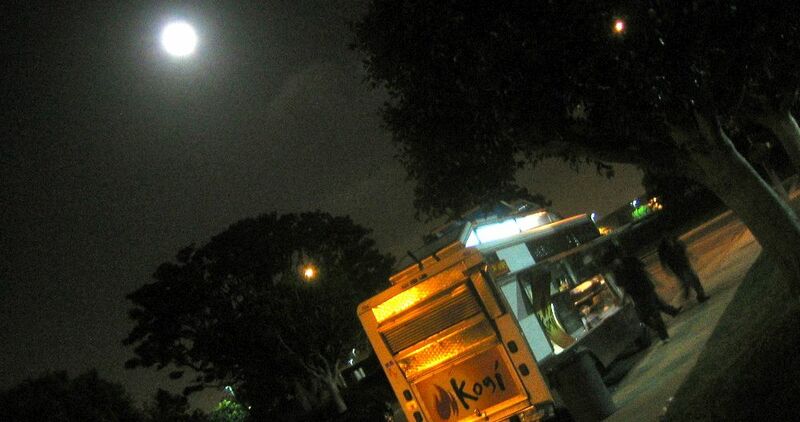 If youre in the LA area, watch for em on tweeter @kogibbq. You'll be glad you did.